2DiVE4 are a 5 Star PADI Instructor Development Dive Centre, one of the highest dive centre ratings in the world and conduct the full range of PADI scuba diving courses from the entry level PADI Open Water Course right up to PADI Diving Instructor Courses. Our 5 star IDC PADI Scuba Diving School have been teaching new students for the past 16 years and have thousands of course certifications to their name. 2DiVE4 is located on the Herts/Essex border in Bishops Stortford, close to Stansted, Cambridge and Saffron Walden. 2DiVE4 are the closest PADI Dive Centre to Cambridge! Our entry level PADI Open Water Course is undertaken from our scuba school in Hertfordshire, at our training pool in Hertfordshire and at our scuba training lakes in Cambridgeshire and Leicestershire. Other course locations will be relevant to the type of PADI Advanced course you undertake. The PADI Open Water Course is conducted over two weekends and is the entry level course that will give you your initial licence to dive anywhere around the world to the depth of 18 metres with another qualified diver. 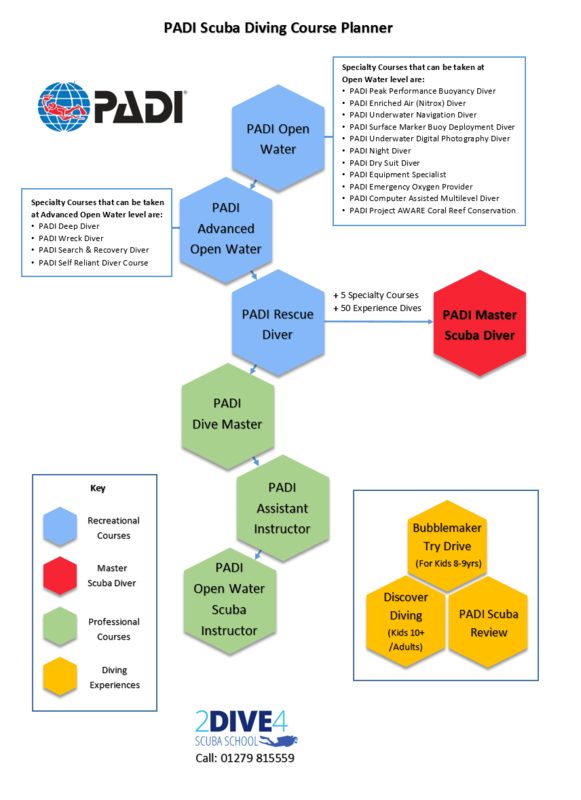 This course is taught with one on one supervision as standard on all of the open water dives. PADI Advanced Open Water Course. This course is conducted over one weekend at an open water training location and is made up of 5 Adventure dives; generally Peak Performance Buoyancy, Surface Marker Buoy Deployment, Navigation, Deep and Wreck. Once you’ve completed this two day course you will be certified as a PADI Advanced Open Water Diver to dive down to a maximum depth of 30 metres. PADI Rescue Diver Course. This course is the course every scuba diver should look to achieve. It just so happens to be the most fun and rewarding diving course that 2DiVE4 conduct and will teach you the rescue skills and techniques to use in a variety of diving scenarios. You need to have had recent first aid training to participate in this course and we can offer that with the Emergency First Response Course that can be conducted in half a day or an evening. On top of these three core courses there are a variety of one and two day courses you can participate in. These are called ‘Specialty Courses’ where you can learn all types of diving skills like Dry Suit Diving, Wreck Diving, Night Diving etc. If you get certified in all three core courses, plus 5 ‘Specialty Courses’ and build up your diving experience to 50 dives you can apply for your PADI Master Scuba Diver rating. This is the highest non professional diver level you can reach. 2DiVE4 offer a Master Scuba Diver package that offers you a package of courses at a discounted price for you to reach your Master Scuba Diver rating. If you are looking to become a professional diver and would like to join the 2DiVE4 team then the first diving course to take is the PADI Divemaster Course. To participate in this course you need to have gained your PADI Rescue Diver certification. The PADI Divemaster Course is conducted over a period of 6 months and contains many training modules that will turn you into an elite diver and a diver all student divers look up to. You will gain experience through working with our experienced dive team on a variety of courses. The PADI Divemaster is a necessary certification you need to participate in the PADI Assistant Instructor Course, or PADI Open Water Scuba Instructor Course. 2DiVE4 offer a Divemaster Package of courses at a discounted price for you to reach Divemaster status. PADI Scuba Review; A theory and pool refresher session if you haven’t dived for 6 months or more. Our various levels of PADI courses are available for the beginner, the returning and advanced scuba diver. Our scuba school is the leading PADI course centre in Essex and Hertfordshire and our divers come from all over Essex, Herts and Cambridgeshire including Chelmsford, Hertford, Harlow, Saffron Walden, Bishop’s Stortford, Great Dunmow, Stevenage, Sawbridgeworth, Loughton, Cambridge, Braintree, Letchworth and Epping.